+ ZAHA HADID . 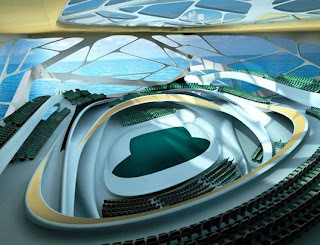 ABU DHABI PERFORMING ARTS CENTRE + WE DO NOT KNOW MUCH ABOUT IT YET, BUT THE FORMS ARE UNREAL. I OFTEN ASK MYSELF, HOW SHE DRAWS THESE THINGS WHEN ITS TIME TO BUILD, OR EVEN WHAT HER INSPIRATION IS FOR THIS TYPE OF WORK. THE LEAF-LIKE ORGANIC FORMS OFFER A SEMITRANSPARENCY THAT RESEMBLES LEAVES ON A TREE FILTERING LIGHT THROUGH ITSELF. THE PIER FLOATS OUT ABOVE THE WATER, PROVIDING A LOOPED DECK FOR PEDESTRIANS TO ACCESS THE WATER VIEWS.